THE CREW OF AIRAT MARDEEV CELEBRATES VICTORY, THE CREW OF ANDREY KARGINOV LAYS IN DUNES. After the 9th leg the whole podium in the truck classification was taken by KAMAZ-master crews. Airat Mardeev was first to win challenging dunes and impassibility from Urumchi to Hami at 50 degrees of heat. Eduard Nikolaev #310 didn’t have such a good day as he intended: “The race organizers mapped correctly the route, because first 5-7 km were easy and every next kilometer became more and more challenging. There were some ‘loops’ which we couldn’t pass from the first time. We were driving on dunes very carefully in order to make no mistakes. We heard a noise, thought that it is a problem with the turbine. We worried that the turbine could break and it takes a long time to repair it. We decided to lose momentum. However, when we left sands we realized that everything was alright. So it could be an external noise. I drove very fast, we were catching up my team, overran Martin van den Brink. And when 30 km left to the finish, our back wheel exploded. Our truck started shaking. We are lucky not to get overturned. It seems as if when we were saving the turbine, our tires were overheated. Because there couldn’t be any punctures in that place. It also may be because of the heat. So, in general we lost time again.” Eventually, the crew of Nikolaev finished the second. After him Dmitry Sotnikov (#300) and Anton Shibalov (303) came to the finish line. Sergey Savostin said that Anton Shibalov goes in a stable way. He has a new truck which was created after the bonnet truck. 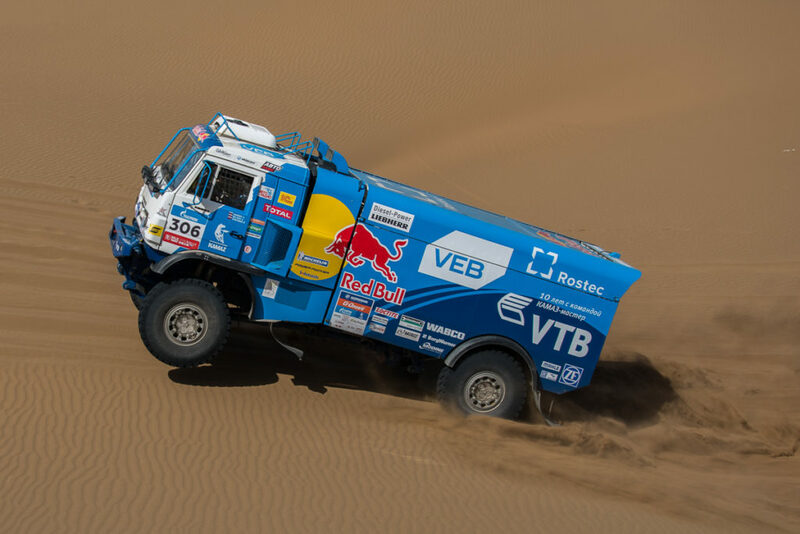 By the way in the general classification KAMAZ takes two leading positions, crews of Airat Mardeev and Dmitry Stnikov go straight after Van den Brink on the second and third positions. But specials become more and more challenging day by day. The tenth leg will lead the contestants to Dunhuan and sacred caves. There will be 525 km during the stage, 340 km from which will be ground tracks and canyons. During the leg the sportsmen will achieve 2 thousand metres above sea level.